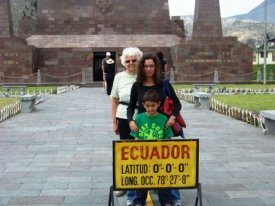 My mom and brother were here for a few weeks, so we decided to take a Baños Ecuador trip. So we got on the bus and headed to Puyo and then on to Baños. You can get a direct bus, but it just happened to be the bus leaving the soonest stopped in Puyo. 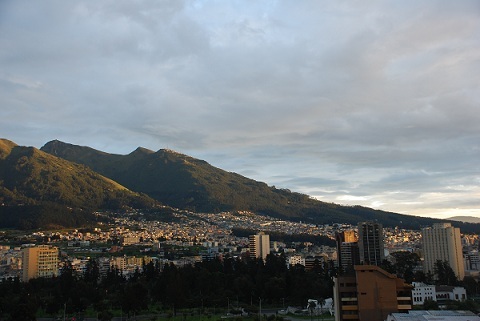 From Puyo buses leave for Ambato, Riobamba and Quito frequently. All these destinations are reached via Baños. 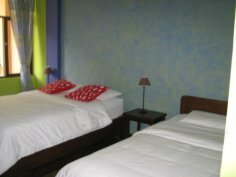 During our stay in Baños, we stayed in a different hotel each day. My mom said it was "research" for my site. Read our Hotel Reviews from this trip. 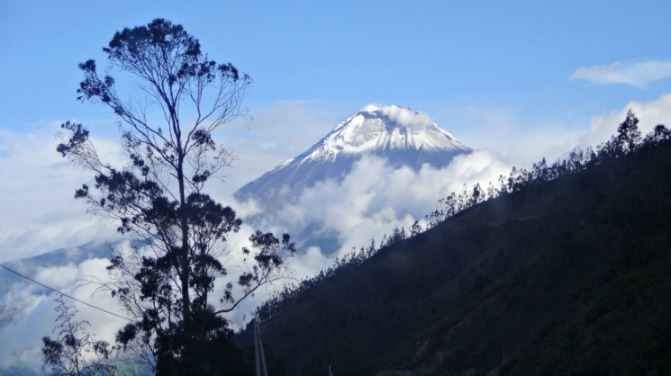 Save 10% at hotels in Baños with Ecuador VIP. Day 1 was mostly a day to recover from the trip. We got on the bus around noon time without eating lunch. So by the time the three and a half hour ride was over we were starving. Since it's been many years since any of us had been to Baños we decided to let Lonely Planet be our guide. We wandered a bit and ended up settling for Casa Good, because it was close to the hotel and some of our other choices were closed due to our strange dinner hour (4:30 pm). Three of us decided on breakfast for dinner. Fruit and pancakes. Granola, yogurt and fruit. Both were just fine. My mom went for the Hindu Plate. Also ok, but nothing to brag about. In the end our verdict... It was nothing special. When I come to Baños or Quito, I'm looking for something special and out of the ordinary to eat. And we didn't find it here. After much debate, we decided to go out to the waterfalls along the road to Puyo. So the next decision was how to go. There are several options to choose from. Those are pretty much in order from cheapest to most expensive. But even the jeep option wasn't too bad. 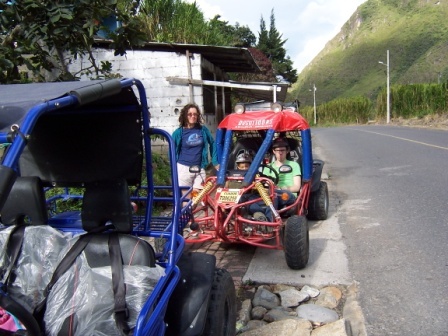 For the three hours they calculate to go to the Pailon del Diablo and back it was going to be about $45 (USD). The next thing to weigh was how much effort were we willing to put forth. Many people choose the bike option...at $5-10 per day it's a good option and you can take all the time you need. But after the mostly downhill ride to the waterfalls the ride back could be killer. 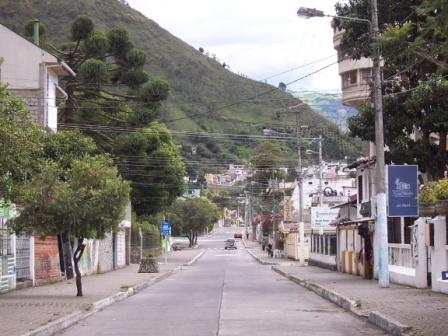 You can get on the bus back to Baños if you're worn out. None of us had ridden bike in years, so we thought it may be more than we could handle. Then we found out that they didn't have an option to accommodate my seven year old. He's a little young to ride on winding roads at the edge of a deep canyon. Although we had eliminated biking, we still wanted to do something a bit more independent than the bus or chiva. Plus my 18 year old brother was along and we needed to keep things interesting for him. We had run across a hole-in-the-wall tour operator who was very helpful. After hearing our options we decided to go in go-kart. We wanted to make sure this was safe. We were assured that during the week the traffic on the road isn't too bad. A weekend trip could be more dangerous. So we got helmets and a map. Plus a cell phone to call the tour office in case anything went wrong (this was very important, as you will soon see). And we were ready to go. The only requirements were to have a driver's license from home and to sign a waiver...which I read very closely. Let the Baños Ecuador trip excitement begin. The route was very direct and easy to follow. We did have a small run-in with a pigeon as we passed by the park...I swear, he ran into us! Feathers were everywhere. We had to drive through one tunnel on the road, which wasn't as bad as I thought. 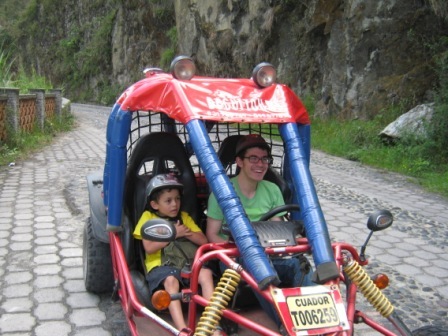 After that there were roads around the tunnel for small cars, bikes and go-carts. The whole drive was very scenic...beautiful mountains covered in trees, the river, waterfalls. 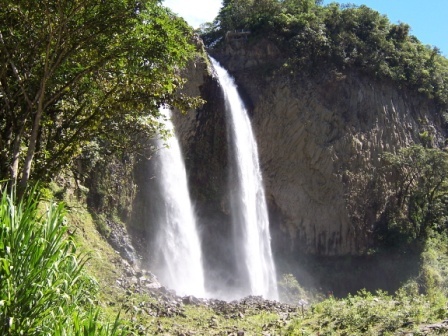 We didn't stop at the first waterfall (Agoyán), because we wanted to make sure and get to the two we really wanted to see. The first was Manto de la Novia (Bride's Veil). 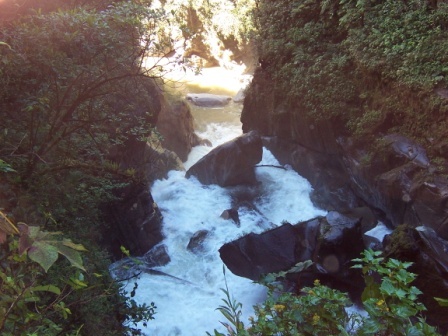 There are two cable car (terabitas) options to see this waterfall up close. We chose the first, because really we didn't know there was another until afterward. This cable car takes you down to the river, where you can cross a bridge to the base of the waterfall. It was beautiful. We were slightly disappointed to see how commercialized all these little spots are now. We paid for the cable car ride. And then after crossing the bridge we found that we had to pay to go in to get in close to the waterfall. So we skipped that. We could see it just fine from the bridge. The other cable car option was just a few seconds farther up the road. From this car you ride straight across the canyon to the top of the waterfall. I'm sure it was great as well, but not for those terrified of heights. We continued down the road to the Pailon del Diablo (Devil's Cauldron) waterfall, one of Ecuador's most beautiful-in my opinion. We were slightly confused by the road signs as we entered to town of Rio Verde. Of course as soon as we asked for help we came across a huge sign and parking lot "Pailon del Diablo." We parked the go-carts and paid $1 for the parking (each). Then the hike. It takes ten to 15 minutes to hike down to the waterfall. It's quite a walk and almost completely straight downhill. When you get almost to river level you come to a restaurant where you pay the entrance fee. The hike turns from straight down to straight up as you approach the waterfall. All along the way we met people coming back...wet. And we were warned that we would soon be wet too. The first observation level is great; there's some spray, but you won't get soaked. From there you can go down to two more levels were you get progressively more wet...until you're soaked. 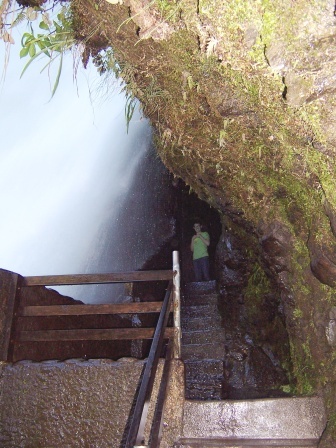 You can also climb up farther and even go behind the waterfall. This is also pretty wet and the path to get up is a bit claustrophobic. The waterfall is so big and you're so close to it that it's hard to take in the whole thing at once. Photos don't do it justice. There is a bridge near the restaurant were you can view it from farther back, but we were told it was closed the day we were there. The hike back up to Rio Verde was exhausting. I thought I was getting in pretty good shape walking around Tena, but by the time I got out I felt 20 years older than I am. Huffing and puffing for breath. Of course, my mom, who is 20 years older, walked out of there like it was nothing. Update! There is another entrance to the Pailon del Diablo that isn't quite as strenuous, but the bridge you have to cross may be hard for anyone with a fear of heights. At the top we stopped for a tourist moment. 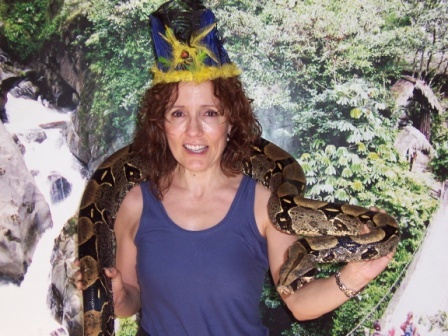 Mom had her picture taken with a live boa. And the little guy with a fake one. As we were reaching the Agoyán bridge something wasn't quite right. My go-cart was slowing down even though I was trying to speed up. Soon we were on the side of the road, out of gas! Thank goodness for the cell phone! We called the lady at the tour agency. She right away sent someone to help (and stopped the time on our go-carts). Fifteen minutes later we saw a man on a four-wheeler with a large water bottle filled with gas. He filled us up and we continued on our way. We drove in right on time to return our go-carts and starving for dinner. As we wandered town we had come across a restaurant with lots of good reviews taped to the windows. So we decided to try it out. It was called El Paisano (The Countryman) and finally I found the variety I was looking for. You could easily miss this quiet, little place, because it's not on the main drag. It's on Santa Clara (Veira) y Marinez. I had chicken burritos (no side dishes). They we're great! 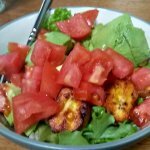 The filling was glued together with tonnes of avocado! And the secret ingredient...Doritos. Seemed strange at first, but it was tasty. 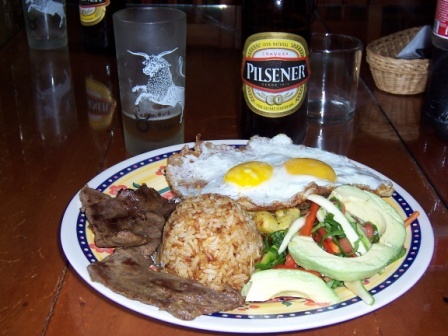 Little Bro had the Churrasco, which is a traditional Ecuadorian dish with grilled beef, rice, potatoes and fried eggs. Quite a combo, I know. He enjoyed it and it was a lot of food for the money. 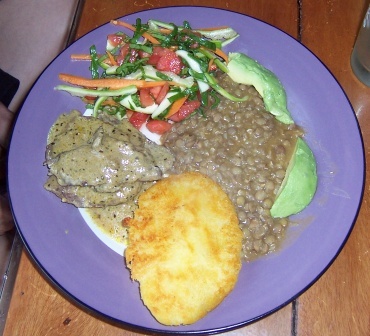 Mom had Lomo al Paisano (Loin), which came with menestra (lentil stew), potato pancake and salad. She also raved about her food. Little guy had ham pizza. It wasn't the best pizza I've ever had (the sauce was a little too oniony), but the little guy enjoyed it. Overall we enjoyed our meal and left happy. 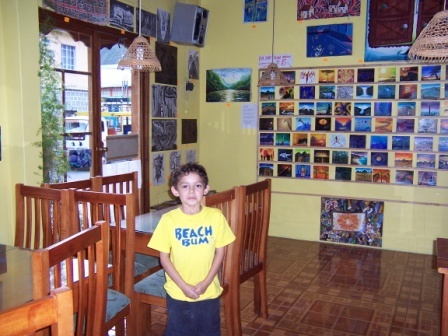 The owner was very friendly and had his own artwork on display and for sale. I would definitely recommend trying El Paisano. 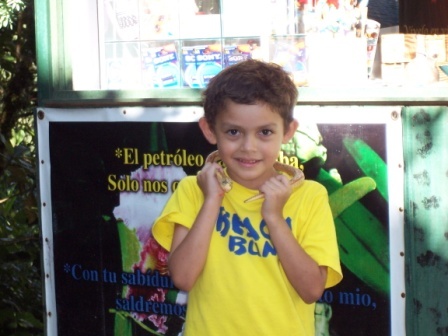 Update 2014: We were recently in Baños again and Paisanos appeared to be gone. If anyone knows if they moved somewhere new I'd love to find it again! The reviews on TA end in early 2013 so I am pretty sure it's gone. That evening we thought a soak in the thermal pools would be a perfect end to the day. The only pools open past 5 pm are the Piscinas de La Virgen. It was only a few blocks from the hotel so we walked over. The price felt like highway robbery to me...maybe I've lived here too long...but how often are you in Baños? So I handed over a $20 bill to the lady for the $10.50 fee. Now, change in Ecuador is a problem, but usually if you're spending more than a few dollars people are willing to find you some change. The lady was incredibly rude. She insisted I figure out a way to give her $10.50, even after I explained that it was all I had. In the meantime, my brother and mother are looking at the crowded, tiny pools and thinking this is not such a great idea. So I asked for my money back and all the lady could say was, "Good!" 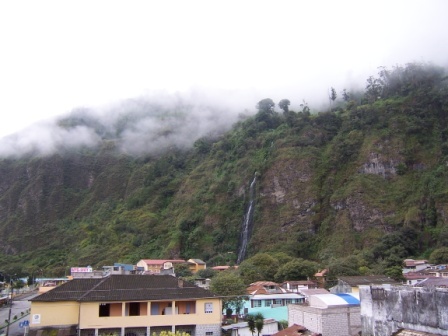 Baños and thermal pool are synonymous and I regret we didn't get the chance to enjoy them. We will go next time for sure, but not to the Piscinas de la Virgen. I have my pride. Besides I hear the Piscinas Las Modernas are better.